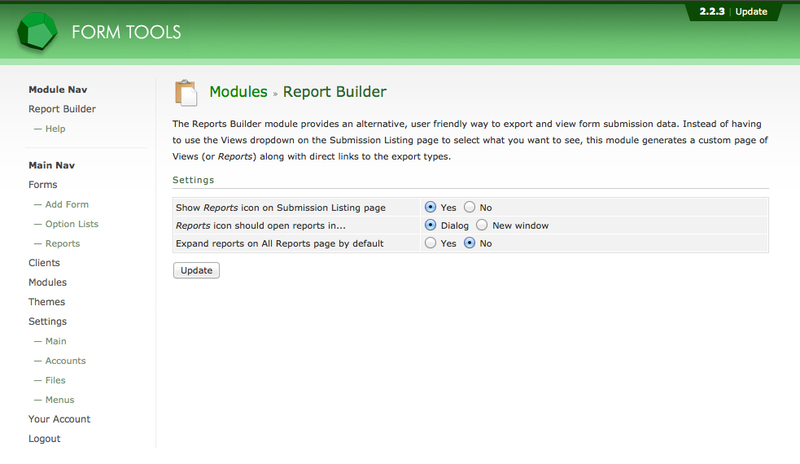 The Reports Builder settings are pretty self-explanatory, but we'll document them here, just for thoroughness. When you select the module from the Modules page, you'll see a page that looks like the screenshot to the right. Here's what the settings mean. This setting is enabled by default; it determines whether or not the reports icon should appear on the Submission Listing page, as shown in the screenshot to the left. The Reports icon is a very convenient way to quickly view all reports for a form, but in case you don't want it to be displayed, just set this setting to "no". This setting determines the behaviour of the Reports icon. By default, it opens up the reports in a dialog window (i.e. the URL of the page doesn't change and an overlay appears which contains the reports). Dialog windows can just be closed, returning the user to the original page. The other option is to open the reports in a totally new page. Both methods show the same reports - they simply differ in how they behave. This setting was added in 1.0.2 of the module. In previous version, the "All Reports" page (which lists all reports for all forms) hides all the form reports by default and you need to click on the Expand button to view them. This setting just lets you control whether or not that list is expanded or hidden by default.